Ebba Pauli was a socially committed and active lecturer and author during the first half of the twentieth century. She contributed to changes in poor relief laws, the establishment of the “hemgård” (settlement) movement and an increased interest in psychology and spiritual healing in medical care. Ebba Pauli was born in 1873 to a well-off Stockholm family. Her father was a functionary and a headmaster, whilst her mother was active in local poor relief work. Ebba was initially home-educated, along with her four siblings, by a hired tutor. She subsequently attended Högre lärarinneseminariet (the advanced teacher training programme) in Stockholm. This was followed by university studies in Switzerland. She lost two of her older siblings to scarlet fever in 1880 which, according to her surviving sister Magda, had a lasting impact on Ebba Pauli. That experience along with her own history of illness led to a desire to try to understand how illness and suffering affected people’s lives. It was through her mother’s influence that Ebba Pauli became involved in poor relief at an early age and she earned the attention of Agda Montelius of Svenska fattigvårdsförbundet (the Swedish poor relief association). This was one of the largest member organisations within the Centralförbundet för Socialt Arbete (CSA, the central association for social work) which was established in 1903. Ebba Pauli thus found a forum for both her lecturing skills and her writing talent, which at this time focused on the so-called social questions and criticism of the obsolete poor relief laws. Ebba Pauli’s public breakthrough came in October 1906 when she gave a very remarkable lecture at a major poor relief conference at Blasieholm church in Stockholm. That a young woman was both allowed and able to lecture to an audience of nearly 600 almost exclusively male poor relief representatives was sensational at that time. One of the delegates at the conference, Erik Palmstierna, recounted that he saw experienced poor relief men cry during her lecture. Parts of her speech were printed the next day on the front pages of the main Stockholm newspapers. It was probably Ebba Pauli’s skill at public speaking, which was characterised by her constant focus on individual people’s fates, which awarded her a prominent position in the social debates of the early twentieth century. She was, however, also active both as an investigator and as an organiser of practical social work at the same time. Ebba Pauli was the secretary of the CSA’s poor relief committee from 1905 to 1906, and a representative on the national poor relief law committee from 1907 to 1916. It was the conclusions drawn by the latter committee which provided the basis for the new law, which came into force in 1918. It was extremely unusual, not to say unique, for a young unmarried woman to be given a task of this nature and there is nothing to imply that her role within these committees differed from that of her male counterparts. The desire to change the poor relief laws was central, not just for Ebba Pauli but also for the entire philanthropic movement at the start of the century, and the new law marked a kind of end of the first phase of her career. On her travels Ebba Pauli quickly came into contact with the so-called settlement movement, which sought to bridge the vast class divide of the era by establishing a variety of meeting places for socially-motivated philanthropists and - particularly the youth of - the working class. Along with Natanael Beskow (married to Elsa Beskow and cousin of Elisabeth Beskow), a well-known figure at the time, she set up the first settlement or “hemgård” in Sweden in the autumn of 1912 at Birkagården, in the workers’ quarters near Rörstrand in the northwest part of Stockholm. A playhouse was established for the younger children, which later became a kindergarten, a reading room for the older children and space for musical activities. The library, the lectures, the gatherings and family evenings were open to all. Birkagården was for a long time also Ebba Pauli’s physical home as she moved in at an apartment in the same building as the “hemgård”. Although Ebba Pauli was active in an organisation for practical social work she was first and foremost a person who was ideologically motivated. She was determined to broaden the reach of social issues by placing them in relation to general life questions. The basis of Ebba Pauli’s ideology originated in the so-called Christian-Socialist movement which developed around the turn of the twentieth century, along with her interpretation of individualist thinking, which had its roots in Erik Gustaf Geijer’s philosophy. 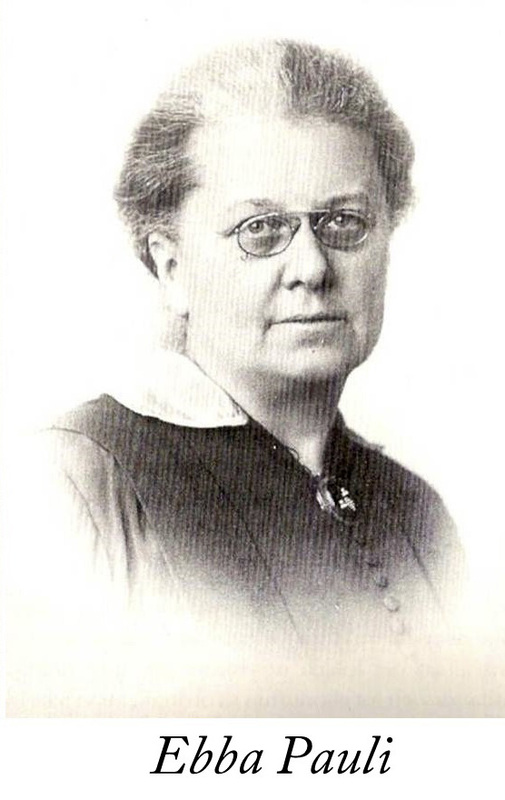 When Förbundet för kristet samhällsliv (the association for Christian community life) was established in 1917 Ebba Pauli was one of its leading figures and she published a range of articles in the association’s journal. One could perhaps view this interest in the Christian foundation for social work as the second phase of Ebba Pauli’s public activism. “All real change in people’s lives comes about through movement from within directed outwards”, Ebba Pauli explained in an important statement of principles at the Christian-Socialist conference in Nyköping in 1927. She believed that Christian social work should deliver results which could completely change community life. According to Ebba Pauli a person’s inner personal development had to form the core of community life, but this necessitated that Christian understanding also had to take on a psychological depth. Ebba Pauli thereby lay the groundwork for what can be described as the third phase of her authorship and social activism. Her books published after 1930 focus on the inner spiritual or psychological life of the individual. The border between a person’s internal and external life became more defined and she spoke of the inner life as “verklighetsvärlden” – the world of reality. In 1936, already suffering from cancer, Ebba Pauli met the Methodist pastor and spiritual healer Göte Bergsten. He was one of several Methodist pastors and laymen who promoted the relationship between spiritual healing and psychotherapy. Inspired by the English Guild of Health movement Ebba Pauli wanted to set up “a peaceful isolated place, where people suffering from illness could regain physical and spiritual health through prayer and internal renewal”, as she wrote in an article for Svenska Dagbladet. She put this into practise by opening a guest house in Borgen in Danderyd, where she herself stayed for several periods when her illness did not require more specialised medical care at Ersta hospital. Serious financial problems arose, however, and the guest house was shut barely a year and a half later. Ebba Pauli said herself that she was not particularly well-read and her writings rarely contain references to other authors. Despite this her comprehensive written and oral output concerned many of the current issues and questions. Christianity obviously formed the basis of all her activities and her religious belief outranked all her other stances. Her political perspective could be described as Christian Social-Conservatism. She was conservative in her view that encouraging responsibility and self-reliance was central in defeating poverty and that family was the most important tool in this encouragement. Any aid and welfare had to be based on a strengthening of personal relationships between the supplier of aid and the one in need of aid. She was suspicious of the professionalized type of social work which the CSA, amongst others, supported. Her interest in psychology and spiritual healing as elements of both social and medical care was shared by many during the 1920s and 1930s, in particular the growing corps of female doctors. Social developments during the interwar period went in a different direction from the one Ebba Pauli believed in. Her desire to build society from the inside out, from the individual toward a community, stood in stark contrast to major contemporary plans for general socio-political reforms. Poor relief and social work seem to have held less interest for Ebba Pauli at this time. She found her intellectual and religious home among the new constellations of healers, priests, doctors and psychotherapists of the 1930s instead. Her lifelong illness certainly played a major role on a personal level, not just in her struggle to remain alive but equally in her thoughts on illness and suffering as fundamental preconditions to understanding the inner workings of people. Ebba Pauli died in 1941 and is buried at the Norra cemetery in Solna. Ebba Helena Pauli, www.skbl.se/sv/artikel/EbbaPauli, Svenskt kvinnobiografiskt lexikon (article by Roger Qvarsell), retrieved 2019-04-22.